Briefing starts the week with a reiteration of what some of you may have heard already today, namely that manufacturing remains at the forefront of the economic recovery. Consequently, the nation’s manufacturers have increased their growth forecast for 2014 to 3.6 per cent from 2.7 per cent. This is the conclusion of the latest quarterly survey published by EEF and BDO, with EEF revealing a continued positive picture with strong trading conditions in all regions and sectors. The positive outlook is being translated into on-going plans to invest and recruit. In particular, recruitment intentions have been positive in all but one quarter back to the first quarter of 2010, and builds on the recent pick up in manufacturing employment reported in official statistics. 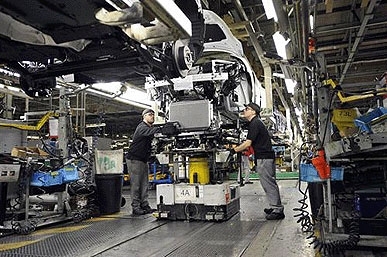 Manufacturing growth and GDP forecast for 2014 revised higher. Tom Lawton, head of manufacturing at BDO notes that manufacturing is outperforming the service sector and GDP more generally, with the automotive sector proving particularly robust. Some of the UK’s leading innovators take centre stage today as UK Trade & Investment’s British Business Embassy launches the International Festival of Business (IFB) 2014 in Liverpool. Focusing on strengths in manufacturing, advanced engineering, automotive and aerospace the invitation only event is expected to attract an audience of over 200 global business leaders, opinion formers and decision-makers from overseas companies and markets, plus heads of UK-based businesses and organisations. Aeromet International will be displaying an Embraer Phenom 300 business jet winglet and a Boeing 737 main landing gear door, whilst prosthetic limb company Chas A Blatchford and Sons, which has been providing prosthetics for nearly 125 years, will be displaying an Elan foot and Orion knee. Xtrac will be exhibiting an FI gearbox and hydraulics system. The event is part of a wider schedule of events over 50 days and coincides with a report published last week by BT that found Britain to be the most desirable country in Europe – and second in the world – for companies looking to expand their business overseas. BT, an official partner for IFB 2014, found in its report – The art of connecting global business – that established markets remain the most desirable to expand into. The USA was found to be the most desirable nation in which to expand (33 per cent), followed by the UK (30 per cent), China (29 per cent), Hong Kong (27 per cent) and Germany (26 per cent). The top three countries were ranked highly based on their potential customer base and the average affluence and disposable income of their citizens. According to BT, the UK is widely cited for the perceived quality of its governance and regulation around IT security and data protection. Thirty seven per cent of respondents highlighted this as an attractive characteristic, reflecting the importance of the quality of IT infrastructure to expansion plans. More information about IFB 2014 can be found here. Great to hear this news. It’s just a shame we hadn’t spent 65 years trying to jettison our industrial base.